Gloria has owned her floral design business for over 20 years. Her variety of styles - traditional, contemporary, and lush and romantic - are seen in her extensive portfolio. She quickly grasps what her clients want, defines the style, and helps them with ideas, regardless of the budget. Hiring Gloria gives you access to her many years of experience in addition to her sound advice at no extra charge. She is fun to be with and is a most calming influence during the often stressful times of wedding and event planning. 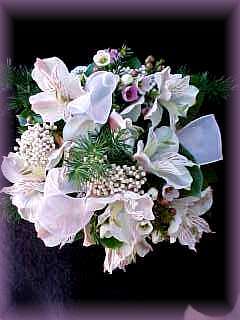 Stunning bouquets & centerpieces, beautiful ceremony arrangements, to all other decorations for your wedding. Let her talent, taste, and creativity make your dreams & vision come true. With 20 years experience Jessica delivers consistent high quality. A picture is worth a thousand words . . . Visit her website @ www.fleursfrance.com. Call Jessica for a free consultation appointment. Your wedding day is one of our specialties. We will design the most wonderful flower arrangements for you. It will be exquisite, fragrant and done in a very relaxed atmosphere. Call our shop, we will be delighted to answer all your questions. Let us take care of your flower needs for the most important day of your life. We offer unique and elegant Floral designs and customize every wedding to your specific needs. 23 years experience in the hotel industry. Feature florist for Bridal Showcase. With over 17 years of floral design experience Consuleo has won several awards for floral arrangements and gift baskets at the Sonoma County Harvest Fair. She is a full service florist who will capture and create a personalized look and feel for your special day. I believe in quality and service and fell this has had a direct effect on the success of my business. Timeless Topiary grows flowering and non-flowering topiaries from 6 inches to 6 feet. We have the largest selection both for sale and for rent. Enhance your next celebration with the natural wonder of our topiaries. ... a timeless piece of art for your home. For a fraction of the cost of the original flowers, you can capture their memories forever. The flowers from your wedding can be beautifully preserved in a timeless piece of art for your home. Your pressed flowers will be artfully displayed on hand made papers such as rice, silk, linen, cotton, and paper made from the bark of trees. To embellish your pressed flowers, rhinestones, gold leaf and glitter are applied. Your art piece is then framed under glass, preserving your special memories forever. Area Covered: Bay Area, Napa and Sonoma Counties. Serving Napa and Sonoma counties and the Bay area, specializing in European and custom Floral designs for your wedding or special event. Please call for a free consultation. Pressed Bouquet! A Beautiful Remembrance of One's Wedding to Cherish a Lifetime. wedding bouquet preservation and all-occasion flowers. Ph. (415) 454-3706 - "Greater Bay Area"
Burns Florist was opened in 1908 by Phoebe Burns, great grandmother of the present owner, Debra Burns Cain. The store has continued to be Marin's finest and most elite florist, furnishing old fashioned service and quality. All of our work is absolutely guaranteed. Very Elegant floral designs with a European touch! Joyce Van Kempen-Hankins is an award winning florist, raised in Holland and European trained! Personable, friendly service, providing each bridal couple with their own customized wedding! Please feel free to telephone for more information. Specializing in customized Fresh and Silk Floral Designs; affordable silk rentals: centerpieces, sprays, swags, arches, and props to enhance your wedding site.